The rapid democratization of political life following the February revolution in Paris out paced police regulation until Louis Napoleon Bonaparte's coup d'état of December 1851. Recently historians, such as Maurice Agulhon, John Merriman, and Ted Margadant have shown that a dialectic of revolution and repression unfolded after February 1848. Innovations in political organization elicited novelties in governmental repression. As a result, state brutality became more overt while political organization became more clandestine. Only Louis Napoleon Bonaparte's coup d'état in December was able to break this cycle. This event sparked the final armed insurrection in French history and represented the last sustained nationwide attempt at conspiratorial politics. The growing sophistication of police regulation and governmental repression over the period 1848-1851 insured that these forms of collective action were now obsolete. February 1848 produced the greatest political and social eruption since 1789. The immediate proclamation of freedom of the press and of assembly and association brought an avalanche of newspapers, clubs, and associations. To facilitate the exercise of these freedoms the revolutionary government refashioned the administrative and police machinery and removed much of the Orléanist personnel. Urban revolutionaries and workers were the first to benefit from this transformation. Only in 1849 did radicalism begin to make effective inroads into rural life. 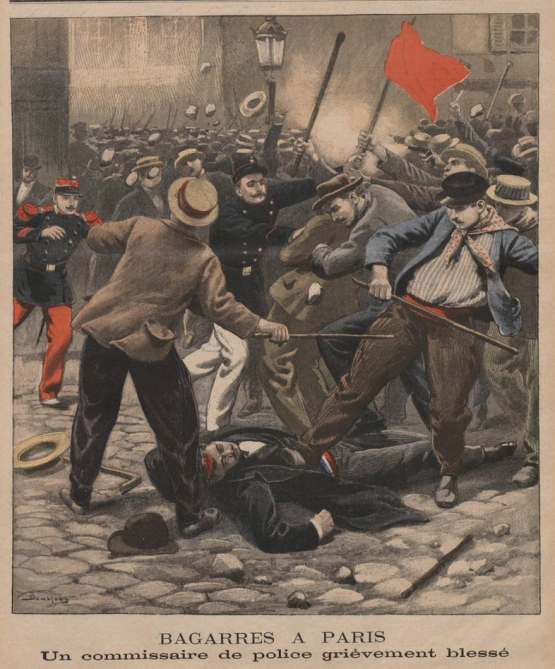 Even before repression of the Paris workers during June 1848, governmental authorities in the emerging "party of order" began to build the police apparatus that would eventually stifle this revolutionary process. The press and the political clubs were their first target. The unsuccessful demonstration of June 13 served as a pretext for a series of new restrictive press laws by June 25. In August the legislators required papers put aside caution money to pay governmental fines. Over the following three years increases in newspaper taxes and broadened definitions of sedition would hobble the popular press. A decree of July 28, 1848 reimposed close government supervision on clubs. Within a year, a law of June 19, 1849 severely restricted the right to association. Finally, the laws of July 1849 banned clubs and all political associations, and an amendment in 1850 required police at all gatherings. Political expression at banquets became the target of governmental repression in an 1850 law. The electoral franchise then became the focus. The law of May 1850 cut the number of voters by over one third. The party of order also struck against traveling salespeople who often peddled politics along with their products. Newspaper vendors also came under a close supervision in a law of July 1849 that dramatically reduced their number from 30,000 to 500 by 1874. These measures laid the foundation for the dissolution of republican groups such as Solidarité Republicaine and Comité pour la propagande democratique et social in the same year. These repressive measures drove the Republican dem-soc movement underground. Agulhon, Merriman, and Margadant also have shown how the era of the clubs was followed by the age of the private clubs (chambrées) cafés, cooperatives, and secret societies. Merriman persuasively argued that these measures destroyed the dem-soc movement in urban France by the time of Louis Napoleon Bonaparte's coup d'état in December 1851. Margadant and Thomas R. Forstenzer maintained that similar success was not achieved in the countryside. Instead, by 1851, a national conspiratorial network had penetrated into French village life, especially in the center and the south. Repression in these areas had produced exactly what the authorities had feared: an underground they could only dimly perceive. The initial repression had removed the upper and middle class patrons, usually lawyers, journalists, or doctors, from the movement. As a result, lower middle and working-class people had taken leadership positions. Thus, the police could no longer rely on intelligence gathered among the notables in towns and cities. Vertical solidarities replaced horizontal ones, and word of mouth took the place of the increasingly restricted press. In addition, the organizational structure shifted from electoral committees under bourgeois patronage to clandestine societies led by shopkeepers, artisans, or farmers (cultivateurs). In these small agglomerated villages, halfway between urban and rural life and often mediating the two, mayors and municipal councils often sided with their fellow villagers against their official superiors. The central government then turned to the police commissioners. Although they had rarely exercised any political responsibilities before 1848, by December 1851 they had become the important agents of centralized administration beyond the seats of the sub-prefectures. Their police powers now extended throughout the cantons, not just in the commune. But they too proved unable to pierce their veil of village solidarities. The coup d'état finally brought this cycle to an end. But it did so only by declaring a state of siege in thirty-two departments, mainly in the south and east, which suspended normal police and judicial processes. The mobile columns of soldiers, gendarmes, and police that terrorized populations and arrested large numbers highlighted the failure of local intelligence and the recalcitrance of ordinary courts. The special administrative tribunals setup to judge the 26,884 cases brought before them contained a prefect, police prosecutor, and a general. These mixed commissions solved the problem of harmonizing military and civilian interests. These extraordinary judicial investigations, which did not bother with legal niceties, obtained sworn depositions from suspects, and the resulting documentation enabled the army and police to dismantle most of the underground networks. The scale of this action far exceeded any other police measures versus political activities in rural France in the nineteenth century and its arbitrariness guaranteed its success as it sliced the vertical ties that had held the secret societies together. But, as Forstenzer has cogently argued, these were not neurotic witch hunters with a blind and indiscriminate rage but instead frustrated, moralistic bureaucrats dedicated to imposing their image of order. The Second Empire consolidated many of these police state innovations. Both urban and rural police forces were now almost double what they had been in 1830. In 1854 the Parisian police would introduce the system of beat policing, in imitation of the London system, to assure a more systematic and continuous system of surveillance. Most important under Napoleon III the government instituted a central police file. As politicization entered daily life, police surveillance became more minute and more rigorous. See also bibliography under "Political Mobilization." Agulhon, Maurice. The Republican Experiment, 1848-1852. trans Janet Lloyd London and Paris: Cambridge and Editions de la Maison des Sciences de l'Homme, 1983. Forstenzer, Thomas R. French Provincial Police and the Fall of the Second Republic: Social Fear and Counterrevolution. Princeton: Princeton University Press, 1981. Merriman, John M. The Agony of the Republic. New Haven: Yale University Press, 1978. Willette, Luc. Le Coup d'Etat du 2 décembre 1851: La Résistance républicaine au coup d'état. Paris: Aubier Montaigne, 1982.